Basant Maheshwari is one of the popular stock pickers of India. He is a founder of theequitydesk.com and writer of book “The thoughtful Investor”. Basant Maheshwari is a commerce graduate from St Xavier’s College Kolkata and is also a Cost Accountant. He is a master in identifying multi-bagger stocks. Pantaloon Retail, TV18, Titan, Page Industries and Hawkins Cooker are multi-bagger stocks identified by him. Basant Maheshwari follows simple strategy for investment. He invests in market leaders that pay dividend at regular intervals gives a substantial return on equity and have high sales growth. He never goes for hunting of hidden gems. He invests in a stock that is already on a winning track. In this post, I will share Basant Maheshwari Stocks and Investment Strategy. Basant says that one should focus on big money & not fast money. Zyaada Paisa banana Jaruri hai Jaldi banana jaruri nahi. He supports his argument by saying “Most people start buying shares thinking they will make Rs 2,000 or Rs 5,000 a day. But that cannot change your life. What can change your life is making Rs 2 crore or Rs 5 crore over many years”. One should focus on the stock that has potential to make big money. As per Basant Maheshwari stock market is not for regular income. You can earn money from stock market but it will not help you in paying your utility bill or tuition fees. The stock market is for long term investment. The stock where you invested your money may not perform for several years. He advises investors to invest enough money in equities. Equity investment should make a difference in investors wealth. He also says one cannot create wealth by investing small amount Rs.50,000. However, before investing big money one should understand equity market thoroughly. As per Basant “With markets falling, no one has become rich by buying gold, no one becomes rich by taking out bank FDs.” It is reverse once you become rich you buy gold and FD. The objective of Gold and FD is capital protection and not money generation. He explains this by giving an example of HDFC. Investment in a Fixed deposit of HDFC can give 8% pre tax return. However, investment in HDFC stock can generate 16% CAGR return which is far better than fixed deposit. Basant Maheshwari gives a lot of stress to knowledge and reading while investing in the stock market. He explains this fact with a simple example. He says that for investing in Gold and FD we don’t require great knowledge and reading. However, for investing in the stock market we require knowledge and reading. If you don’t know investing in equity market go for a mutual fund. It won’t pay off like individual stocks but it will still work out better than bank fixed deposits. Good mutual funds usually give a return in the range of 14-16%, which is still better than 8% return of fixed deposit. 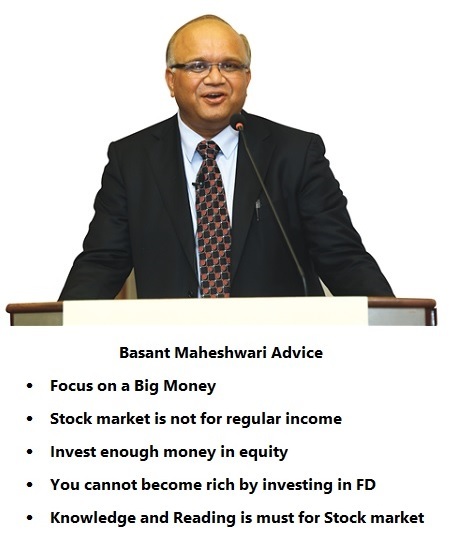 I am 100% sure investment strategy and practical advice of the thoughtful investor Basant Maheshwari will help you in stock market investment. If you are planning to start a Journey to Financial Freedom Through Stock Market Investing, it is highly recommended to read his book “The Thoughtful Investor”.